If you’re planning on spending any amount of time in the woods, you’re going to need a means of treating your water so that you can safely drink it. Sure if you’re going car camping, you can bring all the water (and other assorted beverages) you will need or want for a few days. However, if you like to camp via canoe, kayak, or go backpacking, you can’t carry all that water with you and you will have to find some along the way. Finding water isn’t usually a problem in the woods but you can’t just drink it without treating it first or you could get very sick. The problem isn’t just that the water may look dirty from silt or sand; the real danger comes from what you can’t see like bacteria, such as salmonella, cholera and E.coli as well as protozoa, such as giardia and cryptosporidium. That’s the stuff that will make you very sick, very quickly and could leave you fighting for your life while you’re in the middle of nowhere. There are lots of products on the market to treat water and they all have their up sides and their down sides. Pump filters for example take a lot of effort, tend to leak, break easily and can cost a ridicules amount of money (from $60 to over $300). Gravity filters are nice because you can just fill the bag with ‘dirty’ water, carry it to your campsite, hang it up and let physics take over while you do other things around camp. They aren’t too expensive either at around $100 for a system, although they can be a bit bulky. You can also use purification tablets (like iodine tabs) and although they are cheap and take up nearly no space in your bag, they tend to leave your water tasting rather nasty and won’t filter out silt or particulates. Another option is a Steri or UV pen which will kill bacteria, protozoa and even viruses but once again, it won’t get rid of particulates and they require batteries, which will of course be dead when you need to use it. And lastly…you could always boil it. Yup…that will kill all the nasty stuff but you will still have particulates and you also require a fire, a metal container of some sort and a way to support it over the flames without burning yourself. Not to mention the means of starting a fire. If that wasn’t enough to think about, you also have to consider cost (costing more does NOT mean it’s better) with options ranging from $30 up to $400, as well as size and weight (especially if you’re backpacking). You also need to consider how many people are in your party and how much water you need to treat at once. If you’re looking at filters, you really need to pay attention to how small the filter membrane is and if it can it be cleaned/maintained (ideally in the field). Most filters can filter down to 0.2 microns which is fine because the smallest bacteria are only 0.2 microns in size. Some filters are only 0.5-0.3 microns so that doesn’t make them a great choice for backwoods camping but some filters are an impressive 0.1 microns and that can even stop some viruses. Viruses from a river or stream water is’t really a huge concern in North America but if you’re traveling to Africa or parts of Asia then it would be a good idea to include a Steri/UV pen in your bag as well as your filter kit. If you’re going to get a Steri/UV Pen, don’t forget to pack extra batteries! As for chemicals or toxins in the water…that’s a whole other problem and nothing can really deal with that. If you think your water source may have been contaminated by chemicals, find another source. Filters won’t really help much, nor will UV treatments, iodine tabs or even boiling. Well now that I’ve made deciding on what to buy seemingly impossible, let me simplify things a bit and introduce you to the Sawyer Squeeze. 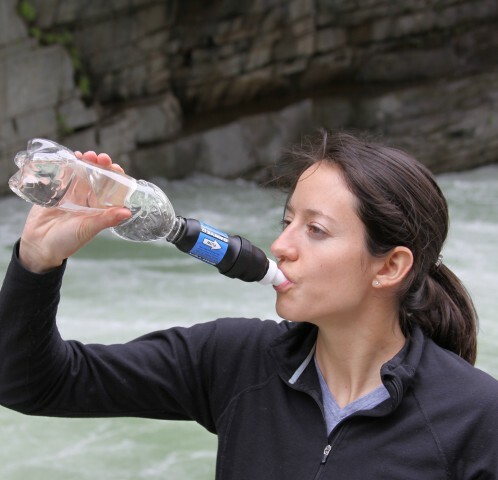 The Sawyer Squeeze is an excellent light-weight water filtration system. Actually, considering the cost, weight and size, this is probably one of the best filters on the market for suiting the needs of one to three people. Sure, you can still use it if there are more people in your group, it’s just less practical since it will take a lot more time to filter all the water you will need. It can filter 1 Million gallons of water (enough for a lifetime really), comes with three different sized bags (16oz, 32oz and 64oz) and it can be cleaned/maintained in the field. Oh…and it only costs about $50-60 online and that includes the filter, three different sized bags and the syringe to back-wash the filter every once in a while. Lets start by covering the specs; weighing in at only three ounces, you won’t even notice it in your pack and it fits in the palm of your hand so it takes up very little space. It’s also one of the few systems with a 0.1micron filter able to eliminate 99.99999% of all bacteria and protozoa and no matter how nasty the water is, the Sawyer filter will make it clear and tasting mountain fresh. The Sawyer Squeeze has no moving parts so there is really nothing to break and it works as quickly as pump systems, but without the physical effort. Just attach the filter to one of the bags (filled with untreated water) and start squeezing the bag. The treated water can then be squirted into a water bottle, pot, or directly into your mouth. This is a much better way to go than with pumps where you have to sit at your water source pumping water into a bottle. With the Sawyer, you just fill the bag from the source and walk away filtering it as you need it, on demand. You can also get or make some adapters to attach it as an in-line filter for the hydration bladder in your backpack. You can also easily attach regular water or pop bottles instead of using the included bags. So what’s the downside you ask? It’s the bags. Earlier versions of the bags weren’t very durable and the seams tended to burst. The newer bags though are more durable but you could still burst the seams if you squeeze them too hard (ease up there Hercules!) and squeezing hard really isn’t necessary (try rolling the bag to squeeze the water through the filter). You could even rig up a way to hang it and use it as a gravity system leaving your hands free. The other problem is filling the bags. Unless you can fully submerge the bag and fluff it out a bit (blow into the bag first to fluff it out), getting water into the bag can be a bit of a pain. Collecting water from a puddle or stream that isn’t at least 6″ deep can be a tad frustrating. It is expected that you regularly use the included syringe to clean the filter by back-washing it with clean water. This is especially important to maintain a good flow rate and prevent the filter from getting clogged. If you’re filtering especially nasty water, be sure to back-wash it right away with some of your freshly filtered water. All in all, this is a great filter system that will last you years and filter more water than you could ever drink in your lifetime. Even if you destroy the bags, you could use a water or pop bottle with a standard sized mouth and full threading, or you can easily buy replacement bags online. With a little creativity, you can make it a gravity filter or, as said earlier, make an in-line filter for your hydration bladder or just buy the adapter kits to do so. Not only is this ideal for your camping needs but it would also make a great addition to your home emergency kit should your water supply become contaminated or should you no longer have a reliable water supply to your home. Sawyer also offers a ‘purifier’ kit that will remove 99.997% of viruses should that be a real concern for you (and I do mean real concern, not just your own paranoia). If you’re traveling to Asia, Africa or India (or helping out in a disaster area) and there happens to be a Hepatitis outbreak, the purifier kit might be worth considering but otherwise, it’s probably overkill. They are a lot more expensive at around $200 online but the cost could be worth it if you’re in those types of places with an active virus outbreak. Like I said earlier though, viruses from your local lake, river, stream, or even swamp, aren’t really a concern in North America. If you really can’t shake that worry and it’s only occasionally, just filter your water and then add some bleach (3 drops per litre will do) and wait 30min. That will kill pretty much anything but now your water will taste a bit nasty thanks to the bleach. Keep in mind though folks…if your water is contaminated by chemicals or toxins, you’re not going to be able to treat that in the field. No, I wasn’t paid by Sawyer to praise their products so highly. It’s just that good and gets a 10 out of 10 in my books. In fact…I bought three kits and I never go camping without at least one of them, even if it’s just car camping.